Producers Harmon Kaslow and John Aglialoro will be rounding out their Atlas Shrugged movie trilogy this year with the currently titled Atlas Shrugged Part III: Who Is John Galt? The movie has begun filming and has been awarded an entirely new cast and crew as it preps for a September release. The first two Atlas Shrugged movies were ambitious and underrated, but neither found major box office success, despite rigorous marketing pushes from Kaslow and Aglialoro. However, the films have found better success on video and through merchandising on their website, where a cult following has revealed itself. Like the last movie in the franchise, Atlas III sports an entirely new cast. The two primary protagonists of the story, Dagny Taggart and Hank Rearden, will be portrayed by Laura Regan and Rob Morrow. 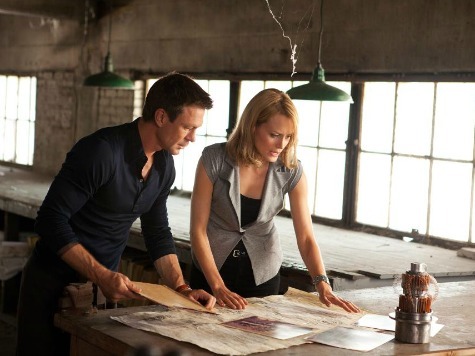 Taggart was formerly played by Taylor Schilling and Samantha Mathis, while Rearden was previously brought to life onscreen by Grant Bowler and Jason Beghe. Other cast roles include the characters Ragnar Danneskjold and Francisco d’Anconia. Those parts will be played by Eric Allan Kramer and Joaquim de Almeida. The film’s director is James Manera, co-creator of Chevy’s Like a Rock ad campaign. The producers have stressed that Atlas III will be the best and most faithful in the series, and they have put forth a marketing strategy that includes playing the movie in 500 of the most successful theaters the previous movies played in, as well as premiering shortly before the 2014 mid-term elections. With a fresh cast and a recently very successful kickstarter campaign, Atlas III seems like it may, in fact, be the best of the series. However, the real pressure on the movie is in how it performs at the box office. The original Atlas Shrugged was supposed to be a box office hit, considering the popularity of the book. It was also supposed to mainstream conservative films at the box office, but it failed to do so. In today’s world of crowd funding and online streaming, box office means less than before; nonetheless, the first two movies’ failures at the box office has given liberals and movie fans alike the ammo to label the Atlas Shrugged films disappointments and failures altogether. That is not true, of course, as both have found success and are very strong movies. However, it would be nice to see Atlas III find the mainstream box office success the first films pined for, paving the way for conservative-themed movies to be mainstreamed in some way and vindicated in the face of criticism. In honor of saving the best news for last, the producers have also cast the important role of John Galt. Considering Ayn Rand’s character is the true hero of part three, and is required to convey many big ideas through much dialogue, there’s quite a bit of pressure on the actor taking this role. That actor happens to be the young Kristoffer Polaha (TV’s Ringer, Life Unexpected). “As soon as Kris walked in the room and said, ‘Hello,’ we knew we found him. Kris is John Galt,” producer Kaslow said. Atlas Shrugged Part III: Who is John Galt? will hit theaters in September.